Freeman students held a ceremony Thursday morning honoring Strahan and then dedicating a memorial outside the school in his honor. The Freeman superintendent said Thursday has not been easy. The day marks one year since a shooter opened fire in the school killing Sam Strahan and injuring three girls. Superintendent Randy Russell said students are taking the lead and choosing how they want to remember the day and their late classmate. Freeman students held a ceremony Thursday morning honoring Strahan and then dedicating a memorial outside the school in his honor. For several minutes, the students spoke about Strahan and locked arms as they played a song in his memory. It was not hard to tell that it was an emotional morning for many. After that, they together walked a memorial, made in Sam's honor, to the front of the school. It is a stone that reads, "In loving memory of Sam Strahan. Bravery and Selflessness." The students then went back inside. It was a way to remember that was developed by the students. Classes were in session, but the district took extra steps to make sure resources were available for students. Therapy dogs were on hand in the hallways, and additional counselors were brought in too. It was hard for everyone, including staff and parents. “It was tough and as soon as you got to see some students that were here, ya know, that helped. There’s just been so much outreach today from my family, friends, our staff parents, people from all across the region sent a text, call in, and a couple of my good friends called me this morning and just said, ‘Hey, we’re thinking about you.’ We’re thankful that we get a chance to honor Sam and pull ourselves together for the day, figure out how we’re going to move through it,” Russell explained. Russell also shared a statement from the students. It emphasized that the students did not want to dwell on what happened one year ago but rather remember Strahan, his heroic acts, and his generous personality. Freeman students filling bags on their &ldquo;day of service&rdquo; in honor of their fallen classmat, Sam Strahan. The students mentioned that, as part of remembering Strahan, they collected supplies to be donated to families in need. Strahan volunteered in a kitchen that cooked for those who needed help. 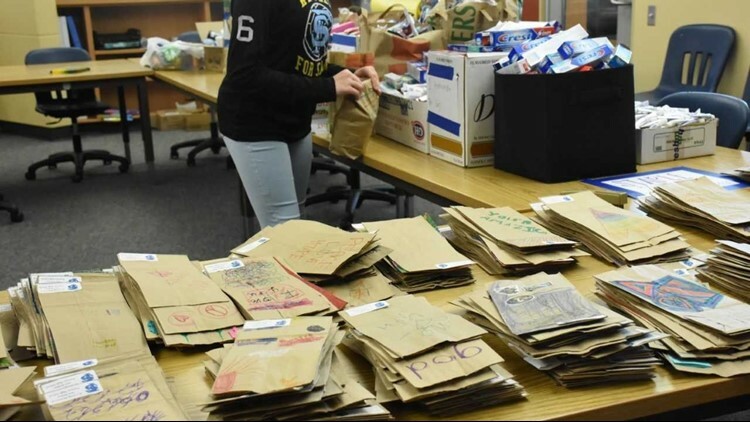 Those students said their goal was to collect 500 bags, filled with essentials. They of course have exceeded that goal.